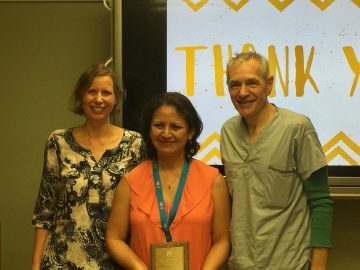 On May 18, 2018 Rosa Garcia was presented with the Dorken Award for Excellence in Service. This is awarded annually to a UBC Department of Surgery staff member in recognition of their outstanding and high quality contributions to the department; improving the value, efficiency and sustainability of the service they provide; consistently demonstrating the Faculty of Medicine principles of excellence, engagement, equity and effectiveness; and making a positive impact on the morale of the Department of Surgery within a division, lab, unit or the department as a whole. Rosa works with Dr. Megan Levings and has been a technician in the Department since 2005 and over the past 13 years has shown an outstanding commitment to continually improving research efficiency and value, as well as to the lab morale and work environment. When she first joined the lab in 2005 she had an instrumental role in helping to purchase and set up equipment as well as to establish standards and protocols to ensure an excellent working environment for all future trainees and staff. Today she remains the central resource for advising on policies and procedures related to lab safety, as well as reagent inventory and storage systems. With the arrival of each new person – from undergraduate coop students to clinical fellows – Rosa takes time to orient them to the lab environment and review any aspects of lab protocols they are not familiar with. In terms of staff morale, through her positive attitude and unwavering commitment to the research process she leads by example.